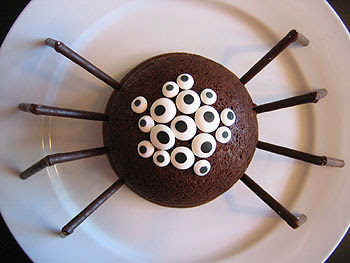 I love these chocolate spiders (by Not Martha on the Design*Sponge guest blog). Who knew Pocky were so versatile? I was thinking here in the United Kingdom we could substitute Cadbury's chocolate fingers. I bet some black licorice strings would work well too, although they aren't always a hit with the young folks. The top spider is my favourite as he (or let's call it a "she", since in my mind she is a Black Widow) is so creepy because of the real resemblance to so many spiders I have met in the past, particularly big ones. 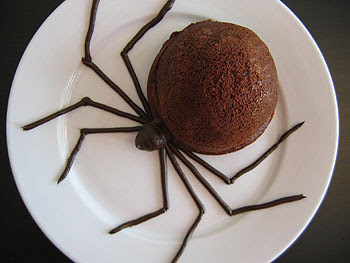 Not that any of us need suggestions of more sweets to eat tomorrow. Remember the pigs who were eating junk food because the price of corn had been driven up by demand for corn to produce US-subsidized ethanol? Is the biofuel worth it? I'm all for (well-considered) alternative sources of energy, but the chain reaction that these subsidies have sparked just keeps going. It turns out that other crops are being turned into biofuels too, notably wheat, which is an integral (and in some forms highly nutritious) part of many diets. Durum wheat in particular is used to make Italian pasta. Now the BBC reports that the Industrial Union of Pasta Makers will be investigated for price fixing after they warned prices would rise this autumn by 20%, which they attribute solely to the rising cost of durum wheat. Irrespective of whether this price fixing is going on, it is true that the price of durum wheat has increased even more than other varieties and continues to break record prices. This is partly due to environmental factors such as poor growing conditions this year, but also to increased demand for wheat for biofuel production and to the fact that land once occupied by wheat is being switched to corn fields for more biofuel. Not that corn is always good thing for the food supply, which is what I gather Aaron Woolf and Curt Ellis have concluded in their film "King Corn" reviewed recently by The New York Times. Corn is used as feed for animals, the majority of whom live in squalid conditions with little quality of life, as well as to produce corn syrup and corn oil, neither of which are particularly good for us. Though corn and wheat (well, primarily their highly processed derivatives) are maligned for health reasons in industrialized countries, they are still a primary source of sustenance for many of the world's poorest people. 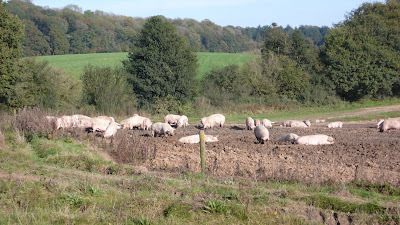 It is true that reducing emissions is very important, but must it impact so directly on the quality and cost of food? According to the International Herald Tribune the UN's Special Rapporteur on the Right to Food, Jean Ziegler, agrees with me. He says there should be a five-year moratorium on the production of biofuel due to its effect on world hunger. Hear hear.